In Victorian times, working class women often earned extra money for the household by making goods at home that could then be sold to travelling agents. It meant they could do the work in between looking after the children and keeping an eye on the cooking pot. In Buckinghamshire one of the commonest crafts was lacemaking. In Willen in 1881, Emily Clare was one of only four women earning money in this way, Sarah Fields and Diana and Emma Markham were the other three. Twenty years before there had been 11 lacemakers in the village, including two girls of 11 and 13. However, it was not uncommon for girls to start lacemaking as early as 3 or 4. Lace was made by winding fine threads around a set pattern of pins stuck into a special cushion. To stop the threads getting tangled and mixed up, the threads were wound around special bobbins that hung around the cushion. The finished lace was protected from dirt by a cloth flap. 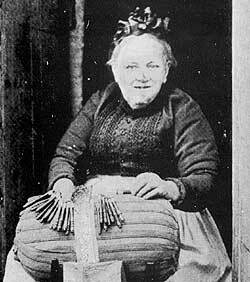 It was customary for the lacemakers to sit in the doorways of their houses when weather permitted, like the lady in the picture. Large numbers of people made lace in this area, sometimes, when agricultural pay was particularly bad, the men made it too. In Hanslope, in the early part of the 19th century, 800 out of a total population of 1,275 were making lace. The production of good machine-made lace in the second half of the century meant that lacemaking at home went into decline. In 1862 a girl of fifteen could work 12-15 hours a day for just one shilling a week pay.